We had a lovely snow this morning. And it's already melted away! Happy early birthday wishes to brighteyed_jill and scribblerworks. May each of you enjoy a fantastic day and a magical year to come! My husband and I went to Asheville to the North Carolina Arboretum to visit the "Emissaries of Peace: The 1762 Cherokee and British Delegations" exhibit, which included a number of artifacts related to Lt. Henry Timberlake's journey among the Cherokees (as depicted in his famous Memoirs) and his voyage with Ostenaco and two other Cherokee chiefs to England in 1762 to meet King George III. The exhibit was well worth the trip; if anyone's in the neighborhood, I recommend seeing it before it leaves in May. We also recently watched the 2008 documentary Our Spirits Don't Speak English: Indian Boarding School, which considers the U.S. and Canadian practice of forcibly removing Native children from their families and relocating them to government-run boarding schools. It's a well done documentary that I'll certainly be using in class in the future. It was especially useful to watch this after seeing the 2008 film Older Than America, a contemporary horror story focusing on the ongoing legacy of the boarding schools (which just became available on DVD late last year). 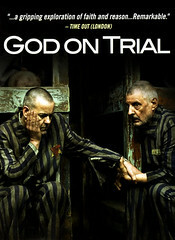 Speaking of film recommendations, I am awed every time I rewatch 2008's God on Trial, which is a brilliantly done film from start to finish. It depicts Jewish prisoners in Auschwitz who decide to put God on trial for breaking the covenant with the Jewish people by allowing the Nazis to commit genocide. It's one I return to repeatedly, and I always forget to blog about it; so there, I recommend watching it. Multiple times. There are masterful turns by Rupert Graves, Stephen Dillane, and several others of those "usual suspects" who always seem to deliver wrenching and beautiful performances. The new semester begins this week. First up this quarter, I'm teaching a graduate course called "Stories of Worlds Gone Wrong: The Dystopian Tradition." Our readings span from E.M. Forster's "The Machine Stops" (1909) to Suzanne Collins's The Hunger Games (2008), but some students will be choosing to do independent work on novels that predate this window. Mmmm, there's nothing like the smell of dystopia in the morning! "Well, it [The Bible] seems to be a good book -- strange that the white people are not better, having had it so long." That exhibition sounds particularly cool. And the dystopias, of course! It was a great exhibition! And thanks. :) My students are hitting the ground running. They're really into it! It really, really is. I'm so glad you think so, too. Aw, thank you! They seem to be getting into it, which is wonderful to see. Me, too. It's one of those "gut punch" lines that really hits hard and makes you take a step back, you know? That's a great quote. And unfortunately, my thoughts exactly. I am back in "no news" mode - at least kinda. I still listen to NPR once every day or two and scan the Google News headlines daily, I am just trying not to think about it too much. Oh, I hope you can go! Depending on the timing, I'd be very interested in meeting up with you and going together, too. I can totally understand the "no news" mode. Unfortunately. *huge hugs* That quote really hits like a punch, doesn't it?